Unique architect designed units nestled into the limestone hills above Port Campbell. Experience 180 degrees of breathtaking views across the forever changing valley to the rugged coastline of the Southern Ocean. Located only 2kms from the town centre Anchors offers quality accommodation in a tranquil environment. A romantic weekend away or indulgent week, enjoy the harmonious ambience at Anchors. Unwind from a day of exploring the Twelve Apostles whilst still capturing the view from your spa bath. Watch the Wedge-Tail Eagles soaring above from the comfort of your deck while enjoying the delicacies of Heytesbury or in the winter months retreat to the warmth of the log fire. Anchors is the ultimate place to discover The Great Ocean Road and all it has to offer. 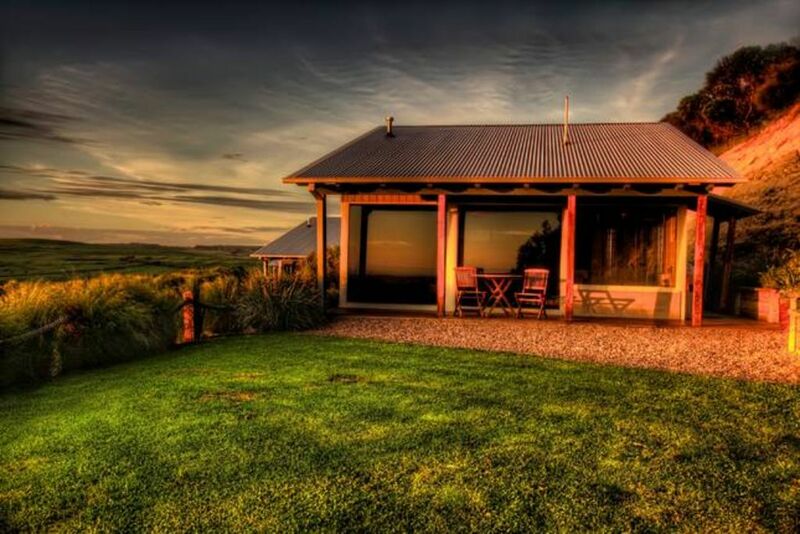 Nestled into the hills above Port Campbell situated on 30 acres of private land Anchors offers two contemporary units with full seclusion. Each unit is identical with a spacious open plan living, elevated bedroom and spa bath with a panoramic outlook. Anchors captures the essence of Port Campbell with a window frontage for unhindered views. Each unit is positioned with your privacy in mind and screened appropriately. Glass tinting and blinds have been added for complete solitary. Stylish decor compliments your experience. Amazing views, only a few minutes drive from town, super clean, well stocked kitchen with good supply of basics (e.g., teas, milk, even a small bottle of wine! ), the spa was devine and very friendly service by Tanya. Can't fault the place! Thoroughly enjoyed our stay. Beautiful accommodation for couples. Perfect position to see all the tourist attractions. The perfect location for a relaxing weekend to re-charge the batteries! Tanya is the perfect host and nothing is too much trouble. The view from the apartment is something you never get sick of looking at. Very nice place to stay. Lovely views, only downside bins were not emptied and not enough cupboard space for self catering guests, blinds over the bedroom windows to block out light in the morning. Great place for a getaway! Gorgeous property, all the facilities you need and lovely family who run the property :) Will definitely be back! Spectacular views, close enough to the local town but far enough to escape from the world. Loved the Villa, ideal size for a romantic getaway. All the amenities that you would require. Loved the stay and would highly recommend.